Vermont is known as the Green Mountain State, but what lies under those mountains? 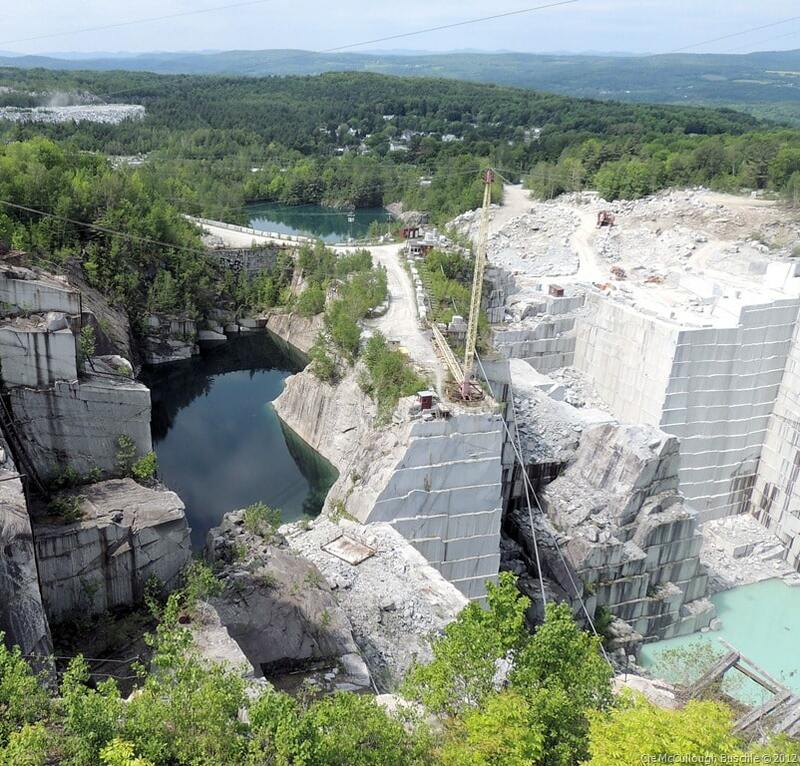 At the Rock of Ages quarry, just outside of Barre, you can get a chance to see. Back in 1885 a man named George B. Milne opened a granite manufacturing business. Ten years later, he and quarry owners James Boutwell and Harvey Varnum came together to create the Boutwell, Milne & Varnum Company. 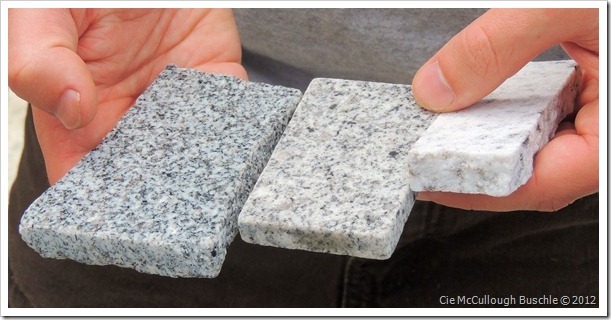 They started a national advertising campaign to educate the public about the superior grade of Barre granite. As part of their idea to gain brand name recognition, in 1914 they started marking all the granite produced in their quarries as Rock of Ages. This name caught on so well that in 1925, when the company incorporated, they adopted the name Rock of Ages Corporation. 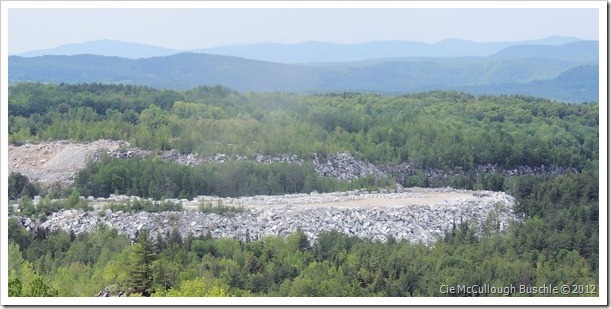 Tourists soon started coming to Vermont to see the quarries. In 1962 a visitor’s center was built, and within three years more than 100,000 tourists per year came to Graniteville just to learn about granite. Today the Rock of Ages tour has been operating for 88 years. 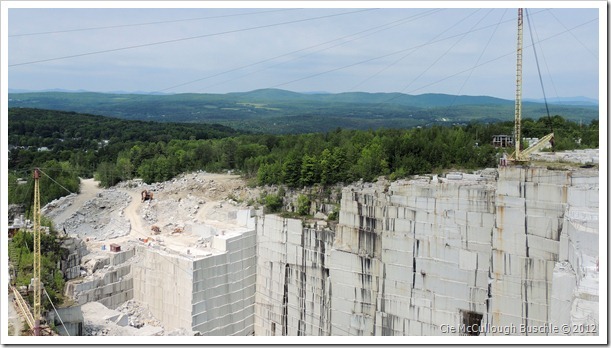 Tourists are taken by bus up to the top of the mountain to look down into a quarry almost 600 feet deep, the world’s largest deep-hole, dimension granite quarry. 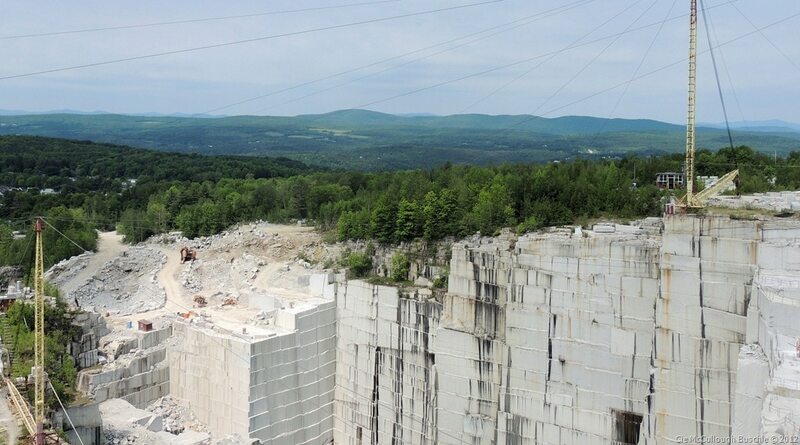 This quarry has been featured on TV shows like Modern Marvels, but even more exciting, it was part of location filming for the movies Star Trek (2009) and The Stone Whistle. Our tour was lucky enough to have a retired science teacher as our guide, who provided a lot of details into the geology of the granite. 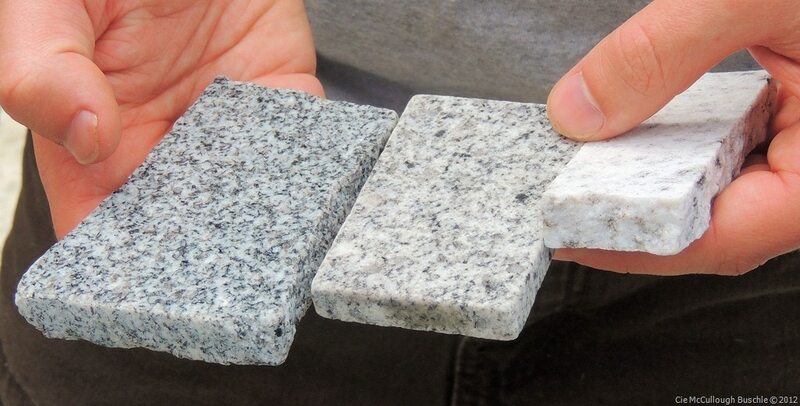 For instance, different shades of granite come from completely different places, and the colors depend on the chemistry and mineralogy of the area where it was formed. Granite comes most commonly in grey, but there are also shades of red, blue, green, white, or blacks and browns to light tan or yellow. Some granite is almost ivory in shade, while the Barre granite tends to look more like snow. The Rock of Ages company is very particular about the granite they send into their workshop. Back when the quarry first opened only 5% of the stone was usable. Due to improved techniques, that number has risen to 15%. Some of the lower quality granite is crushed for use in making cement, and some is dumped into huge piles. As trees and plants take root and dirt builds, these piles will eventually form new mountains. Since we toured on Memorial Day, we were unable to see the inside of the factory. The factory tour shows the artisans and sculptors as they work everyday. Huge blocks of stone become granite statues and monuments, true works of art. 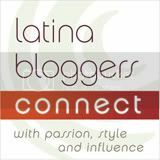 In some areas you will see artisans using methods that have changed very little over centuries, elsewhere you will see lasers and diamond saws. If you prefer, you can visit the factory for free for a self guided observation. The narrated tours operate from the end of May to mid-October, seven days a week, but remember that they quarry is only in operation Monday through Friday. Although the tours operate on Memorial Day, everything is closed for the 4th of July. Cost of the narrated tour is: $5 for Adults and kids 12+; $2.50 for ages 6-12; $4.50 for Seniors 62 and over. Children 5 and under are free, but are asked to sit on a lap if crowded. 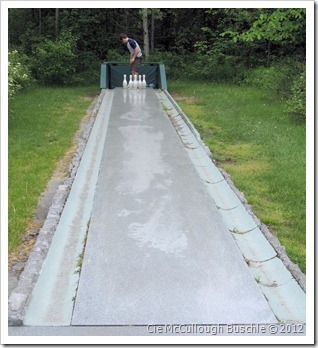 Bring a Picnic and Bowl Outside! Outside the Visitor’s Center and Gift Shop is a great place to have a picnic after touring the quarry. 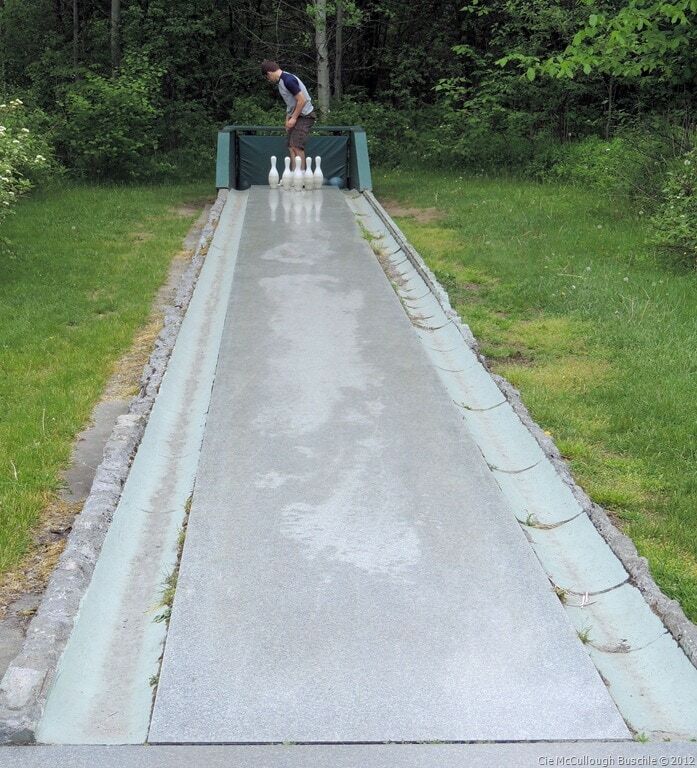 Relax and enjoy the beautiful Vermont scenery, then play a few games of outdoor bowling on a slate lane! If you’re visiting Vermont and can’t pack a lunch, stop at The Energy Store, a little gas station convenience store down the road, for made to order sandwiches at a great price. At Rock of Ages, you can create your own souvenir. Choose your design and step up to one of the sandblasting machines. Prices are reasonable and vary according to size: $9.95 for a tile; $12.95 for a trivet; $15.95 for a wall hanging. This activity is only available mid-June through mid-October. Rock of Ages Granite Quarry is located at 558 Graniteville Road, Graniteville, Vermont. This is very close to I-89, just take exit 6 and keep going straight until you see the Rock of Ages sign on the left! Disclosure: I received free entrance for the quarry tour for the purposes of writing this article. As always, my opinions are mine alone. North Hero and the Islands around Lake Champlain.